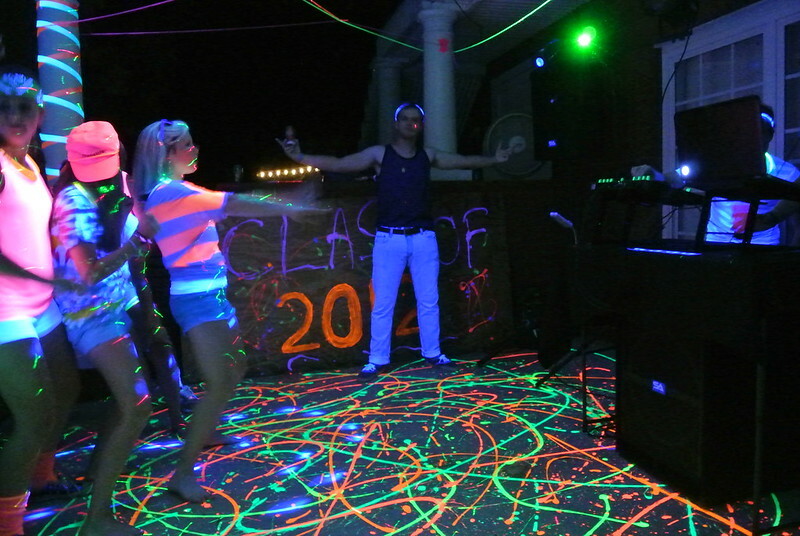 Summer started with a bang, as I planned a blacklight party to celebrate my sister's high school graduation. 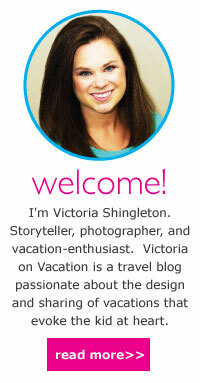 A few weeks ago, I shared the glowing party invitations which were inexpensive and super easy to make. Unfortunately, I didn't get to capture as many details as I wanted from the party because we set it all up during the day, but it didn't get dark until right about when the party started... and things started getting moved around. 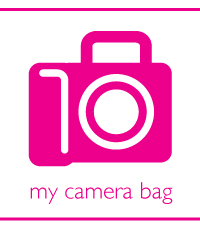 I did get some party pictures and video, though. 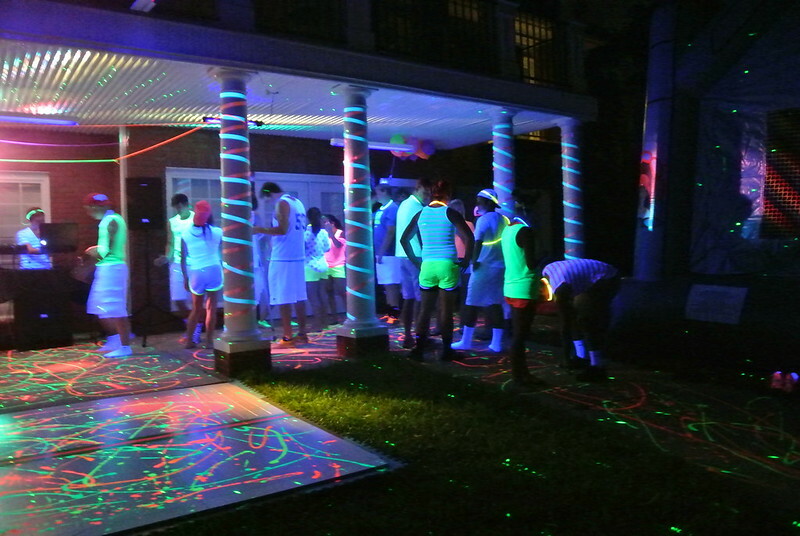 When planning for the blacklight party, I did a lot of research on blacklights to try and figure out how many we'd need, but there honestly wasn't that much information out there (mostly people who have blacklight bedrooms). 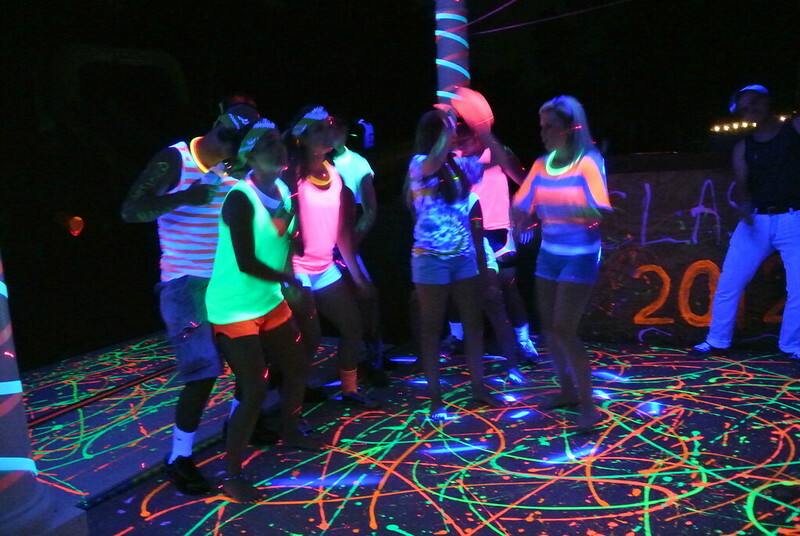 I figured I'd contribute my new-learned knowledge to those who are also looking to plan a blacklight party. We spent the most money on blacklights. 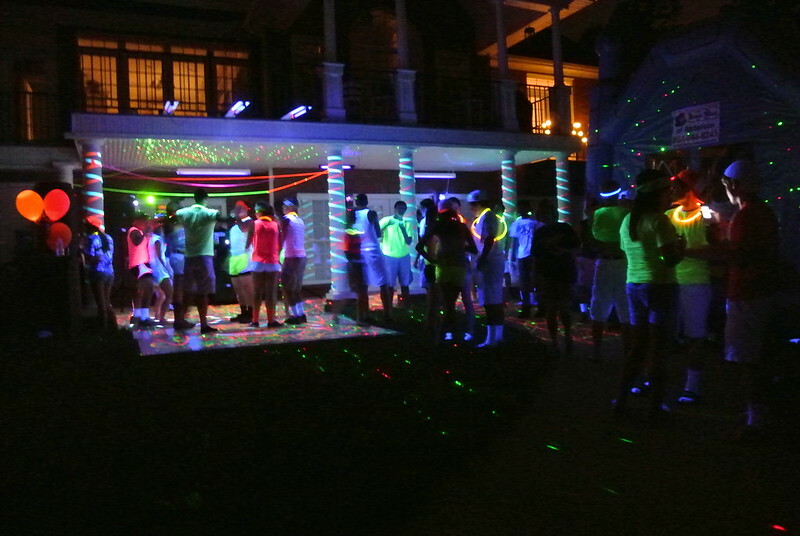 Because the party was outside, we needed more lighting than if it were inside. We spent several nights testing different blacklights so that we could get the perfect arrangement to create the best glow. We found that our best investment was in four 48" blacklight bulbs which we put into two different shop lamps from Home Depot (similar shop lamp here ). The shop lamps cost ~$15 each, and the bulbs cost ~$12 each (2 bulbs per lamp). So, for roughly $40, we had four times as much light as the 22-inch bulbs sold in the casing. We hung the shop lamps over our covered dance floor. 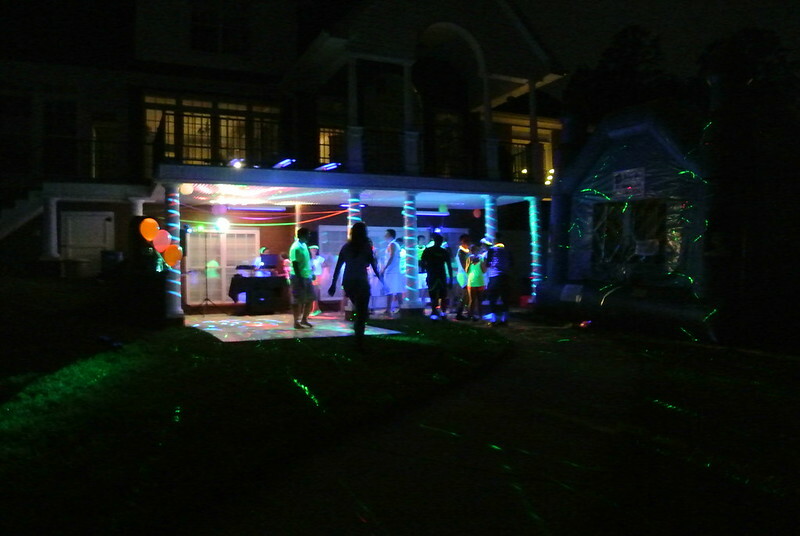 For our extended dance floor that wasn't covered, we extended 24-inch bulbs (found for $18 each at Walmart) over the side of our porch above so that the people below would be illuminated. We also replaced all of our outdoor lights with blacklight bulbs. 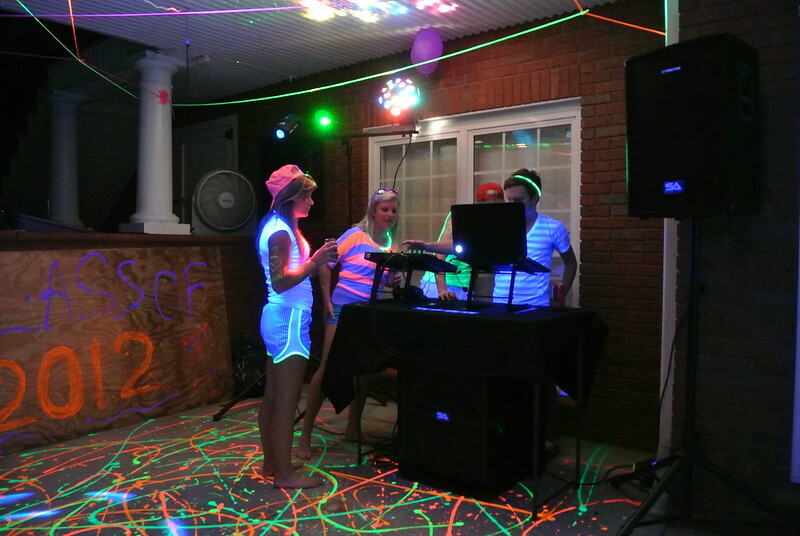 For decoration, I bought blacklight rope in four different colors from blacklight.com to string over the dance floor. I also purchased 2" blacklight ribbon which we wrapped around the poles outside. I purchased blacklight balloons from blacklight.com, as well as LED light-up balloons from coolglow.com, and we inflated them with a Balloon Time helium tank. We had a bit of trouble with the balloons... the light on the LED balloons is kind of heavy, so you have to really inflate the balloons so that they will float (and even then, they won't float for long). And with the blacklight balloons, we thought we'd just let them float on the ceiling, but they all ended up escaping... we should've tied them down. Our cheapest and most effective decoration was washable Neon Tempura Paint by Creatology . The day before the party, Rachel and I flung paint all over the ground, creating a cool splattered effect that really glowed underneath the blacklight. At just $2 a bottle, this was a great, inexpensive decoration for an outside party, and afterwards, it washed off easily with a hose and a scrub brush. One of our most important purchases was the DJ. 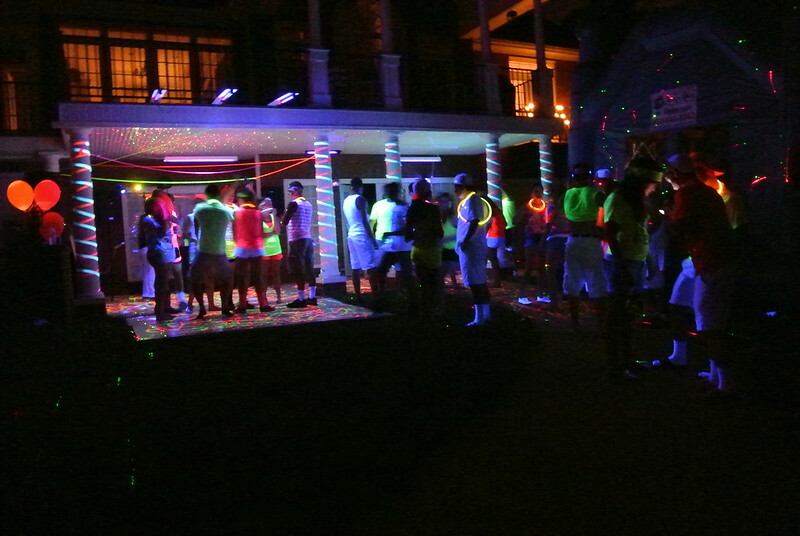 A blacklight party needs good, loud music to create a raging atmosphere. We hired my friend from school who DJs. They brought their own lights that were synced to the music which they were able to project onto the moon bounce for a cool effect. When looking for your own DJ that doesn't break the bank, you might consider searching at nearby universities for students who are just getting started, but are young and can really connect with the audience. The dance floor was actually something we already had... Rachel's practice floor for tap in our basement. My dad had built it out of the plenty of leftover bamboo flooring. He placed it on top of foam mats which was good for the basement garage, but not so good for the ground. It rained towards the end of the party, and the dance floor became one giant slip-n-slide. After one girl busted it, we had to take apart the dance floor and move it.... it was good for the first half of the party, at least! To encourage a party atmosphere, it's important to define a smaller, more intimate space that invites guests to dance. 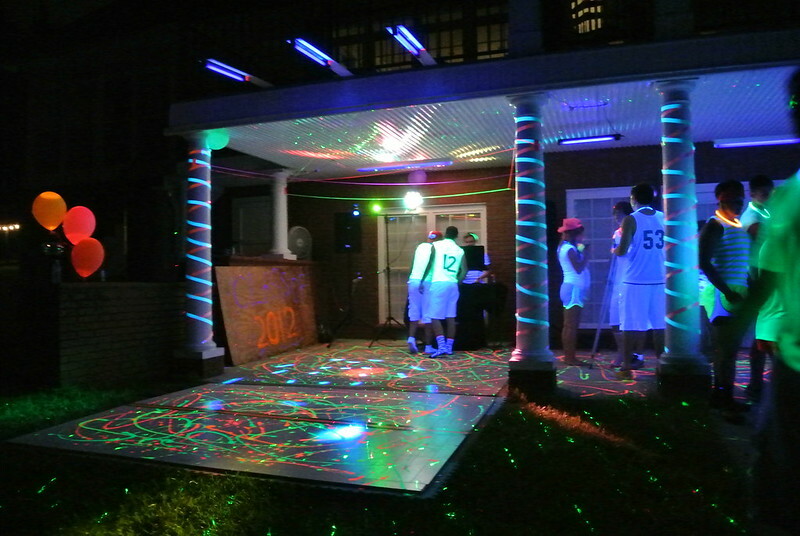 If building a dance floor is out of the question, you might opt to define the dance floor with lights or other barriers. We rented two moon bounces for the party... well, one bouncy house and one inflatable slide. The slide turned out to not be very fun dry, but became very exciting once it began to rain. The idea behind the inflatables was that guests who do not enjoy dancing could still have fun in an energetic way. However, our guests enjoyed dancing so much that two inflatables was a little unnecessary. If we did it again, we would probably only rent the inflatable slide, as it was much more utilized than the bouncy house. It was a fun and memorable party, and the "kids" seemed to be having a great time. I'd be glad to answer any questions - ask in the comments below! Do you recall what brand the neon paint from Michael's was? The paint used to splatter the concrete was Neon Tempera Paint by Creatology. It washes off easily with water. Wonderful, thank you so much for replying!